Claudine Hellmuth Studio is a product line from Ranger Ink full of scrumptious colors of acrylic paints, adorable foam and acrylic stamps, and sticky-back canvas. Claudine's doodly illustrations are really cute and easy to mix and match to create little paint-stamped vignettes. Check out my project instructions and video tutorial at Cool2Craft. Don't toss out that old tee shirt just because it has a stain on the front. Cut it up and upcycle it into a fun art panel! This is a 12' square of Smoothfoam that I covered with the back of a black tee shirt, then created a cute little hillside setting with dies from Spellbinders. Full project instructions and my video tutorial are on Cool2Craft.com. Bunting is a super cute way to enhance a group of pictures on the wall, add some fun to the edge of a bookshelf, or decorate for a party. Each of these banner flags was super quick and easy to make, with all those little squares perfectly lined up, using KellyCraft's Laser Square. Visit Cool2Craft to watch my video tutorial and get complete project instructions. 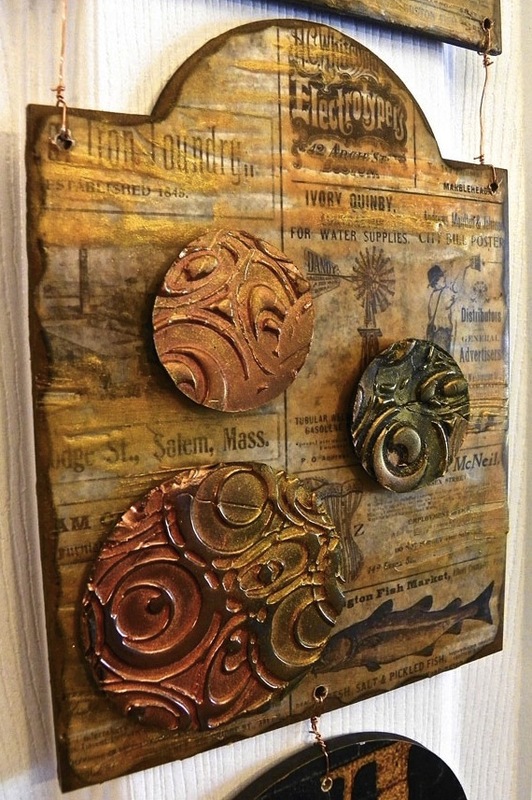 A while back I had found these great wood plaques at a salvage store that were cast-offs from a clock manufacturer. I only bought a few at the time, but now I wish I had bought the whole box! They are perfect for collage and encaustic art. For this project, I worked with an amazing line of products from Ranger Ink called Melt Art - there's a melting pot, mediums, inks, texture treads...way too much fun. Check out my full project instructions with video tutorial on Cool2Craft.com! Last night my local ATC group met for our monthly swap. The theme was glitter and lace - it's a technique we learned where you use lace to mask off a pattern on a sheet of double-stick adhesive. I started with a 1.5" Aleene's Tacky Dot, pressed a section of the lace on top and sprinkled the blue glitter. Shake off the excess glitter, slowly peel off the lace, then sprinkle the yellow glitter to fill up all the remaining adhesive, and tap off the excess. Use the plastic liner from the Tacky Dot to rub the glitter down so it stays put. Then I stamped around the glitter with Perfect Pearls and spritzed the card with Perfect Pearls Mist. 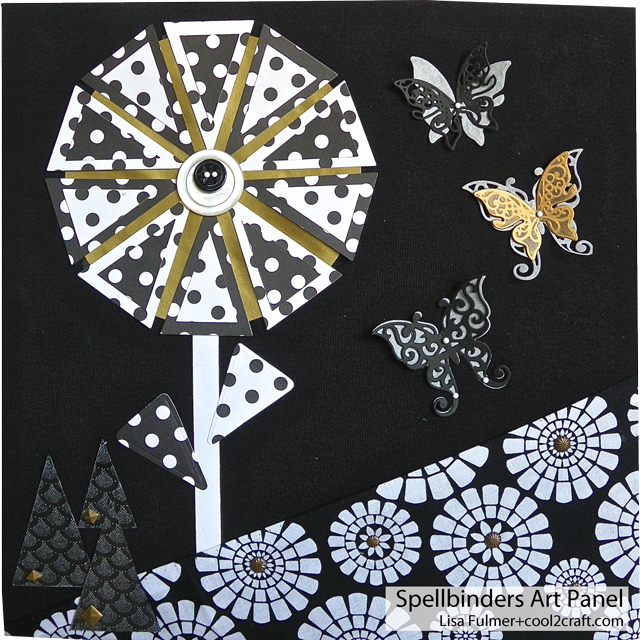 The narrower top card is glued to a backer card that has a strip of aluminum tape on one edge, and I accented the design with a mini dahlia embellishment. Here are the ATCs that I got from the group using the same technique - lots of fun! Slide bracelets by Cousin - with a giveaway! The folks at Cousin recently sent me a lovely selection of products from their new line of slide bracelets, now available in Jo-Ann stores. These bracelets are super easy to make - just slide a few mix and match accents on to finished leather strips, use some heavy-duty glue to attach the closure findings - done! The variety of slider links and beads is huge and the leather bands come in several different colors. You can paint the bands a different color if you want. I added some of their Crystazzi beads and a couple of their Trinkets charms to silver wire, then wrapped the strands around the center slider accent and let them drape on either side. The wire is coiled around the leather at each end. I like the contrast of the distressed denim-colored leather with the sparkly crystal. When you're done here - click on the Designer Crafts Connection logo in the sidebar to hop through more blogs with fun slide bracelet ideas to share. Congrats to Marelle and Carmen - they each won a bracelet! Thanks to everyone who visited and entered my giveaway. This week on Cool2Craft, it's all about bowls. 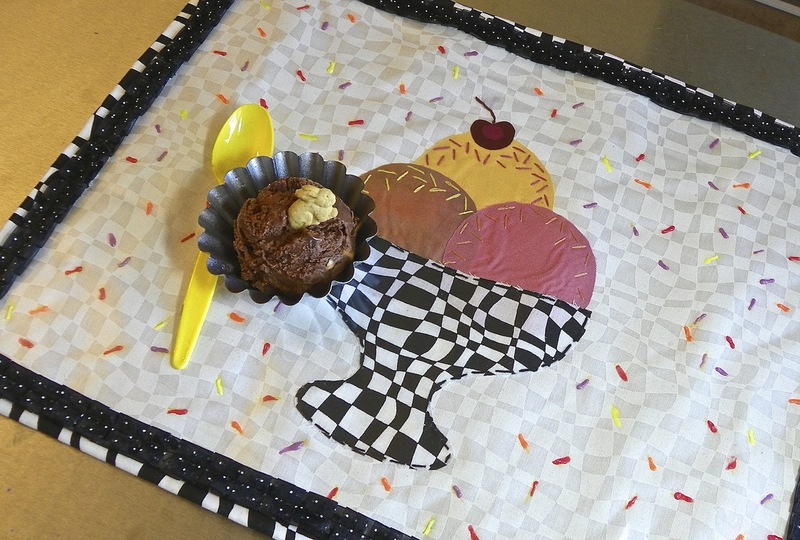 I decided to make a reversible fabric placemat accented with some embroidered "sprinkles." The vinyl-covered front has a cute bowl of ice cream with a ribbon border and the back side is plain black and white fabric. Click here for my project instructions and a video tutorial. It's the first Monday of the month, which means it's time for the Designer Crafts Connection blog hop! 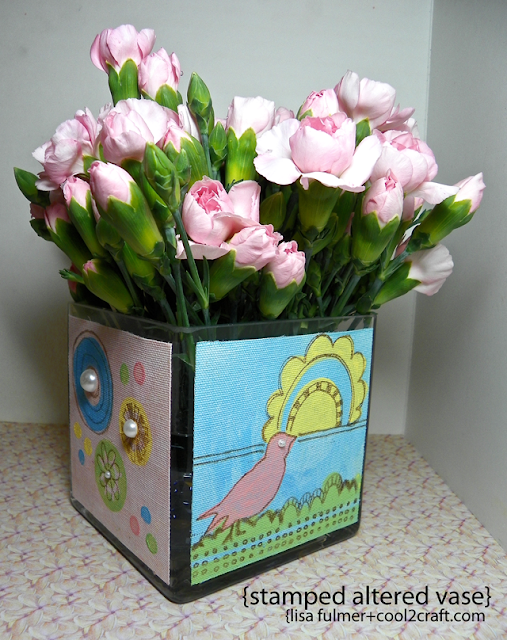 Our theme this month is handmade flowers using only materials we have on hand...with bonus points for upcycling. Well, I don't exactly qualify for the bonus, but I did make use of a stray scrappy piece of polka dot fabric by cutting it in to strips to fold and press into petals. 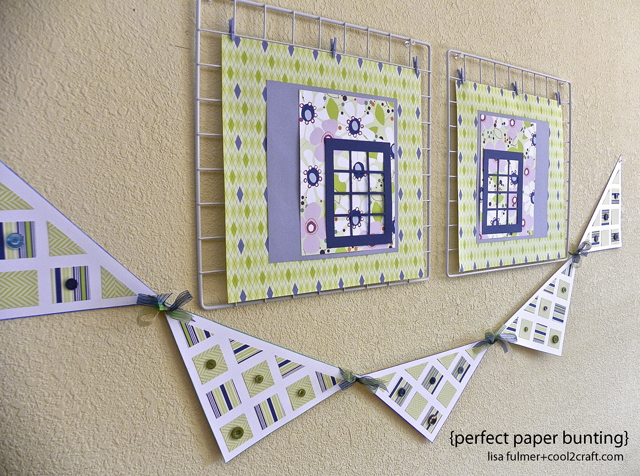 I love combining fabric and paper on greeting cards, especially when I can find different patterns in the same colors. Click on the DCC logo in my sidebar to hop to the next blog, then look for the same logo in her sidebar...and so on. Enjoy!